Carolina OA » Archive » Burn Those Parakeets! The Blue Book listing for Santee Lodge 116 has a curious listing that I'm sure most folks have never heard the story on. 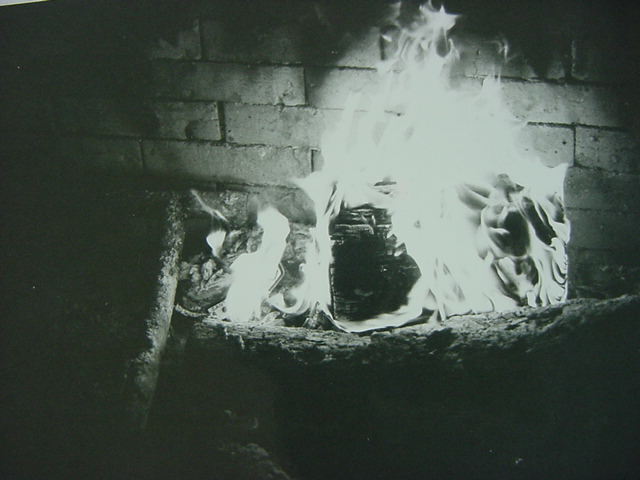 It is listed as ZS1 and the description reads, "Known examples burned in fireplace". Well it just so happens that I stumbled across the only pictures ever taken of this patch and I'd like to share them here on CarolinaOA.com. Let me start off by saying this was NOT the true ZS1 if you want to count patches that were made as prototypes and burned in the fireplace in the dining hall of Camp Coker. But that story is for another day. As for the flap that would become the Blue Book ZS1 this was in the mid-1990s when the lodge finally did vote to move on from the S10 design and go with a design by Steven Askins. In this case there were two prototypes made for the youth to decide between. I'll try and get Steven to comment below regarding his memory of this (who designed the 2nd flap?). One of the designs was approved and went on to be the lodge flap for the next ten years. Faced with the question of what to do with the prototypes it was decided at the business meeting to toss them in the fireplace and let them burn. Luckily, a lodge officer had a camera and took these pictures just before the parakeets met their demise. I am pretty sure this is the only photograph that exists of the ZS1. It's a very traditional design with the red and black border, white background and basic elements that have been in the Santee flaps since 1964. That’s my basic design…traditional Santee look with a palmetto to replace the pastel palm, addition of the colorful pot used in many older Santee designs, & a new detailed energetic bird (that had not not been used much,if ever, in previous Santee designs) to replace the incumbant “burping parakeet” of the flap simply know as the “Current” for the previous decade. Never realized multiple versions of that design were run or that half of them got cremated. Not sure if somebody tweaked my original drawing, but of the two, the S12 that got accepted is the more pleasing arrangement of lettering & arrow angle. I don’t see much other difference. Interesting story for those of us who lived and breathed Santee in the mid 90’s. Thanks. I was really wondering who did the other design and kinda posed the question was it you Stephen. Since its not then I guess we can keep asking around and see – there can’t be that many lodge officers from that time so it’s gotta be somebody pretty obvious.